About Stagecoach (UK Bus) – Stagecoach Group is a leading international public transportation group, with extensive operations in the UK, United States and Canada. The company, which employs around 28,000 people, operates bus, coach, rail, and tram services. The UK Bus division connects communities in around 100 towns and cities across the country, on a network stretching from the highlands of Scotland to south-west England and including major cities such as Newcastle, Manchester, Liverpool and London. Stagecoach is one of the biggest bus operators in the UK, operating a fleet of around 7,250 buses across 17 regional companies. Most of Stagecoach’s UK Bus services are operated on a commercial basis in a deregulated market. However, Stagecoach also operates contracts on behalf of local authorities and provides bus services on behalf of Transport for London in the regulated London market. 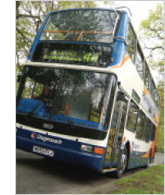 In September 2003, Stagecoach started a six month trial of ENVIROX™ Fuel Borne Catalyst in 1000 buses. The north-west of England was selected to evaluate the performance of the product in rural driving conditions, with London used as the test bed to evaluate the performance of ENVIROX™ in urban driving conditions. The fuel consumption was recorded monthly and analysis was carried out by an independent company. 1) Rural area trial (NW England) – In the rural area, 370 buses covering 15 different types of bus were included in the final analysis. 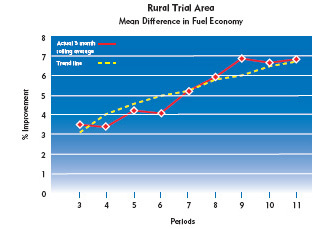 The results showed that after 7 months, the overall fuel economy had improved by over 6% compared to the situation prior to the trial. 2) City area trial (London) – Over 1000 buses were initially involved in the city trial. However, due to depot and duty changes and other factors, only 311 could be included in the final analysis. The results showed an improvement in the year on year average of fuel economy in the buses treated with ENVIROX™, of more than 5% when compared to an equivalent control group. In response to the successful trials in the north-west and London, Stagecoach decided in December 2004, to adopt the product at all major depots across the UK, covering more than 6500 buses. A key part of the adoption of ENVIROX™ by Stagecoach UK, was the installation of easy-to-use dosing equipment at more than 90 depots. ENVIROX™ was added to the fuel in each depot. In most depots the fuel delivery line was modified with a T-Piece to allow additisation during fuel delivery. The installation was completed by the specialist company Cameron Forecourt Ltd. The additisation from a 205 litre drum was controlled by a custom built microcontroller device which determined the correct amount of ENVIROX™ required to treat a given amount of fuel. 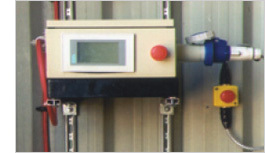 The device was programmed to shut off automatically after delivery and also to remind operators when the drum of ENVIROX™ needed changing. Full training was provided by Energenics staff.